For the past…. I don't know, several years now, I've been trying to find the ideal sleep monitoring/tracking system. I've used apps like "Sleep Cycle", "Sleepbot" and "Sleep as Android" (which I'm currently using) to track my sleep, but I really don't like having to sleep with my phone next to me. Due to weird sleep behavior (mainly, I'm afraid I'll throw my phone across the room in my sleep), I place the phone under my fitted sheet so I needÂ to work to get at it. This is a bit annoying every night, and in the morning when the alarm goes off (I use "Sleep as Android"'s smart alarm feature, so I'm usually awake or close to it when the alarm goes off, but it's still a hassle). I tried using a cheap fitness tracker (the tracker itself was a disaster, but an entirely separate topic that I may post about later), but in the end, I kept envisioning creating a monitor/tracker that would stay on the bed. 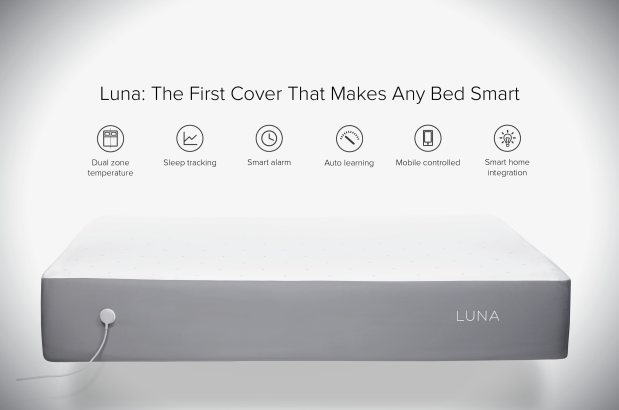 Yesterday the Luna appeared on Indiegogo. It'sÂ a mattress topper that is basically what I wanted to create, and then some. It doesn't just track sleep based on movement, but also heart rate and respiration. It's wifiÂ enabled, so I don't have to worry about manually syncing data or pushing buttons. It will also interface with all the smart light bulbs and thermostats that I don't have. The only thingÂ I'm not a big fan of is that it acts as a heating pad, but that can be turned off (it does increase the cost for a feature I don't need though. My Pre can beat up your Pre! I like this line, "It will also interface with all the smart light bulbs and thermostats that I don't have." Seriously though, I'd like to have both eventually. Smart bulbs are cool, but waaaay too expensive at the moment. I've thought about getting a Nest thermostat several times, but it'd require a bit of prep first. Instead of having a single blower unit for my furnace and AC, the AC unit is hooked up to a blower in the attic with separate ducting, and a separate thermostat. Eventually I'd like to get rid of all the stuff in the attic, and also beef up the insulation up there a bit. Insulation is a better insulator than air ducts. Now the queen size cover costs $299. The price alone will not give me a good night's sleep! No, I think it was a good deal at the indiegogo price. Not anymore. They finally shipped the darn things and I think I got mine either Dec 2016 or Jan 2017. Almost 2 YEARS after this post. 2 YEARS after I gave them money. Phillips Hue! Nice. I would like to get those. My wife likes a warm light, but in photos, everything turns so yellow. I like a neutral light. The Phillips Hue would be fantastic. And, two years to get the bed cover. Wow. Hopefully they spent the time to make sure it works. It works, mostly. It does have its drawbacks. I was hoping that by quantifying my sleep I'd be able to improve it, but it's really just a daily reminder that I (usually) didn't sleep well. It'd be much more useful if I could add tags or notes to a night, or export the data into a spreadsheet or database so I could do that after the fact. That way I could experiment with changes to my daily habits to see if there's a correlation with sleep quality. I have 3 Hue bulbs in the ceiling fan in my living room. I have a scheduled routine at night that dims them and turns each bulb a different red-ish/orange-ish color over the course of a half hour. I have 1 in a floor lamp in my bedroom that turns on at 5am to a dim red, and shifts to white over a half hour. The Amazon Echo is in my bedroom, so I have to shout across my house if I'm in the living room and want to dim the lights or something.